By the mid to late 90’s, the Swingin’ Utters were already legends. Classic albums like Streets of San Francisco, A Juvenile Product of the Working Class and Five Lessons Learned placed the group firmly on the top of the punk rock heap of exciting bands doing exciting things. Many punk fans, like myself, grew up with the gritty melodic slam dance that is the bay area band. Honestly, who can hear the song ‘Five Lessons Learned’ and not be immediately struck with nostalgic memories of sore thumbed marathons of Tony Hawk’s Pro Skater 2? As a flagship band for one of the all time great punk rock record labels, the band helped define the sound of punk rock in the 90’s and before inexplicably ceasing activity in 2003. The members went off and raised families, worked blue collar jobs and played in other bands (notable examples being Me First and the Gimmie Gimmies and Filthy Thieving Bastards). Until 2011, when seemingly out of nowhere (the album was actually in the birthing process a very long time) the band released Here, Under Protest, a comeback album if there ever was one. An instant masterpiece of varying styles, sharp production and well crafted melodies. Less than two years later, they released Poorly Formed, containing even more experimentation and musical exploration to great results. A little over a year after that, Fistful of Hollow is announced, which is one of the band’s best records to date. We caught up with the Utters’ Johnny Bonnel (Peebucks), to discuss the band’s history, the new record and the sudden burst of activity. You guys were pretty quiet as a band for the better part of seven years and now you’ve released three records in three years and toured every one without much of a break in between. Where did the sudden burst of energy come from? Johnny: I guess when we decided to start touring again. Then we thought about writing new material because that’s why you tour usually, to play new material. So that got the ball rolling and then I felt that there was no need to stop. We enjoy doing it, we enjoy writing songs and playing live, let’s just keep going. I think that’s our frame of mind right now, just to keep writing until we die (laughs). So how does it work with each record, do you have a handful of songs that don’t make the album you’re working on and end up on the next one or does every record get its own batch of new tunes? Johnny: Yeah the ones that are left over might go to an EP down the road, or a single or split or something. Some of them go on to the next record, but they all get used. It’s always good to write more than you need for each album. One thing I noticed right off the bat was Fistful of Hollow is a little heavier than Poorly Formed. Did you guys set out to make things a little rowdier this time around? Johnny: I’m not sure if that’s what we set out to do, but Miles, our bass player, I was writing with him this time around, so there’s definitely some different sounding emotions on the record that came from him. But we really try to make a record that has something a little bit different on each release. So it just sort of worked out that way with me and Miles collaborating, there was some darker sounding songs. I know that on Here, Under Protest Darius did the bulk of the writing, then on Poorly Formed it was more a team effort. What was the writing process on this record like? Johnny: It was definitely a team effort. Collaborations are my favorite, so I try to make sure that when I’m writing I’m working with someone. Darius is pretty prolific, so he’s always got a ton of songs already written and he just polishes them up and gets them ready for the record. But I try to make sure everyone pitches in, because I think it’s much more interesting to collaborate with another brain on things. Do you ever sit in a room as a band and write, or do you bring in your own ideas and mesh them together? Johnny: I usually just team up with whoever I’m writing with and make demos. Darius does his own demos in his house. Then we bring them to practice or send them to each band member and they figure out how they want to play their parts. Then we attack it as a band in the practice studio. There are some throwback sounding tunes on here as well. ‘Tonight’s Moons’ for example sounds like it could’ve come off of Juvenile Product. Johnny: Yeah that was Jack. A lot of Jack’s were sort of Ramones-y sounding. But he usually just writes some music and sends it to me and I write lyrics to it. I noticed that on this record you lost the bullhorn vocal effect you were playing with on the last record. Johnny: We actually used it on ‘End of the Weak’. But we just try different things for vocals to make things a little different. I like the cheap sounding microphone. I think it sounds like it has a little bit more heart and honesty than the polished, crystalline sounding vocals. I’d rather just use a crappy microphone. Then you don’t have to worry about your voice not sounding live like it does in the studio. Johnny: Yeah exactly. I can’t stand it when I go see a band and it doesn’t sound right because the record was too overproduced or whatever. Tell me about the cover and the title. Johnny: Those are actually photos from the dustbowl in Oklahoma. I liked them because they had sort of an apocalyptic quality to them. Which I think stands true to today, with everyone still in fear of the world ending. Live In A Dive is one of my favorite live records ever. I love the sound and the set list and everything. Has there been any talk of doing another live record with Miles and Jack? Johnny: There hasn’t been any talk, but I’d be ok with it. I’m actually not a big fan of that, I don’t even think I’ve ever listened to it. Really? You’re not a fan of live records or just of your own stuff? Johnny: Yeah, I think like a lot of people, I just don’t like hearing myself live, unless it’s to find things I wouldn’t want to do again (laughs). But if Fat ever wanted to put out another live record, we’d probably do it in a second. Well, I have to say, you’re one of my favorite bands to see live. You’ve all got a great stage presence. You in particular have a great stage presence. What’s it like to play some of the songs today that you wrote 20 years ago? Is it hard at times to connect to the material with so much distance in between? Johnny: There’s a different element just because I’m older and know a little bit more. I’m not as emotionally spastic as I was in those days. I was usually black out drunk back then for most of those shows, so I don’t do that anymore, that’s just not a good look. I still want to bring the intensity but not be a complete loon. One song you bring a great deal of emotion and intensity to live is ‘Untitled 21’. I know it’s one of Max’s songs, but you really seem to embody the message when you sing it. Does that song in particular connect with you on an emotional level? Johnny: It seems like whenever I sing one of Max or Darius’ songs, I take on a character and become the person in the song. Which is probably why when I sing it I look like I’m about to cry. And some of these songs make me well up just because they bring back a lot of memories. But whatever gets me inspired I’ll take it. Kind of like method singing. Does it get easier or harder as time goes on to make records and go play shows? Johnny: I think it gets easier just because we’ve done it so much. I mean we’re really lucky to get to play shows and meet people and experience different cultures. When we were younger we were selfishly just kind of trampling through the States and Canada and taking things more for granted. And now we know what makes a bad tour and a good tour and you can act accordingly. Getting back to Fistful for a minute, there are a number of songs on this record, like ‘End of the Weak’, ‘Tibetan Book of the Dead’ and ’Spanish’ that make me long for new Filthy Thieving Bastards material. Do you have any updates on that front? 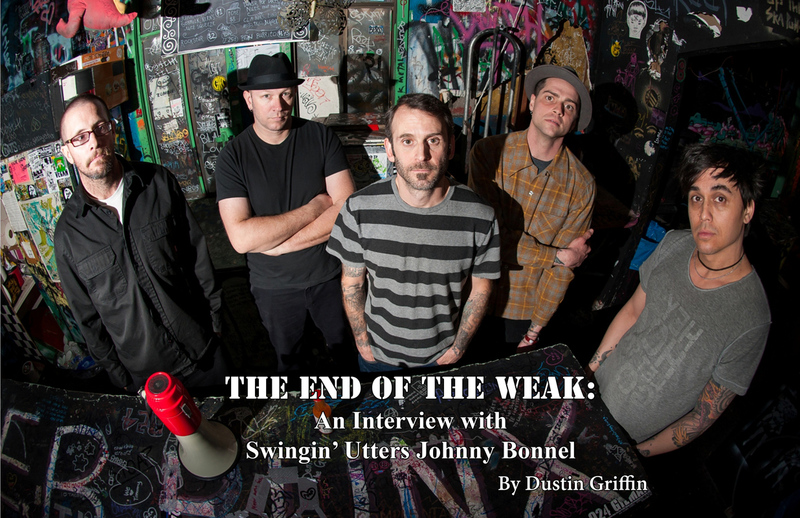 Johnny: Yeah I emailed all the guys and said ‘let’s not stop.’ But then this tour popped up and with the new record we’re going to be busy doing Swingin’ Utters stuff for a bit, but soon as we have downtime I’m sure we’ll jump on that again. When you yourself write, do you write for a specific band? Johnny: Yeah I tend to steer things in a certain direction sometimes, or I’ll write something and know where it’s going to go just by how it sounds. It might start to sound more similar now though. I personally don’t think we should limit ourselves to a certain style of music in Filthy Thieving, so it’ll probably start branching out even more now. I’m sure it’ll be a little cleaner sounding than the Swingin’ Utters stuff though. I love your art and I love that its intertwined itself with the band more the last couple years. Do you find that your art influences your music or vice versa or are they separate outlets? Johnny: Thank you. Yeah they definitely influence each other all the time. I’ll find stuff in my artwork that will inspire me to write a song or the other way around. They sort of help each other out. I really enjoy doing both though so I’m just going to keep doing it. I mean if it makes you happy, you’d be stupid not to, right? Yeah. So you’ve been around for a while, you’ve got some classic records out and are a well regarded group in the punk scene. What about where the band is now are you really happy with and what would you like to change? Johnny: (pause) That’s a tough one. I think I like everything about where we are now. I’m really happy with the band and what we’re doing so I’d just like to keep things the way they are. The only thing I would change is that I wish Jack could tour with us. He won’t be on the Lagwagon tour? Johnny: He’ll be doing some of the west coast shows, but no he can’t get the time off work to tour and any time off he does get he saves for Europe shows. It’s understandable and he’s doing what he needs to do, but yeah that’d be the only thing I’d change if I could.